Sleek and dark, with a wolfish smile that could portray extreme sophistication or out and out villainy, Gerald Mohr did it all, heroic and heavy. From Broadway to radio. From serial villain to crime thriller lead. Top screen narrator and cartoon voiceover artist. 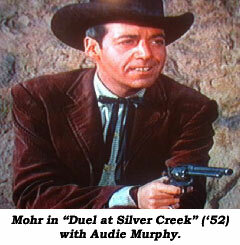 And a western heavy, particularly on the Warner Bros. TV westerns of the late ‘50s and early ‘60s. Born in New York City June 11, 1914, Mohr was the son of Gerald Mohr Sr. and Henrietta Noustadt, a Viennese singer. His father died when he was three years old so Gerald was primarily raised by his mother and grandfather, a psychologist and close associate of Dr. Sigmund Freud, the famed psychoanalyst. Because of this association, Mohr became a fervent student of Freud, studies which he later employed on screen. Mohr was taught piano at an early age and attended the prestigious Dwight Preparatory School in New York, however medicine interested him more at the time. But while in medical school at Columbia University, due to his laconic, resonant voice he was asked to make an audition at CBS. Shortly thereafter he became the network’s youngest special events reporter. 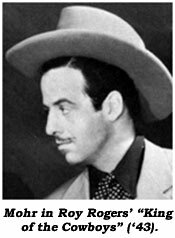 Urged to try for the Broadway stage, he played a minor gangster in “The Petrified Forest” which began its run in ‘35 and made a star out of Humphrey Bogart. 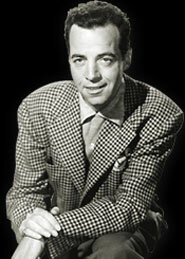 In ‘37 Mohr joined Orson Welles’ Mercury Theatre Company on radio. From there it was an easy step into films in ‘39 where his voice served him well as the mysterious Dr. Zodiac in “Charlie Chan at Treasure Island”. However, on screen, Zodiac is revealed to be Cesar Romero. Then, in Republic’s top serial, “Adventures of Captain Marvel” (‘41), he was the uncredited voice of The Scorpion. 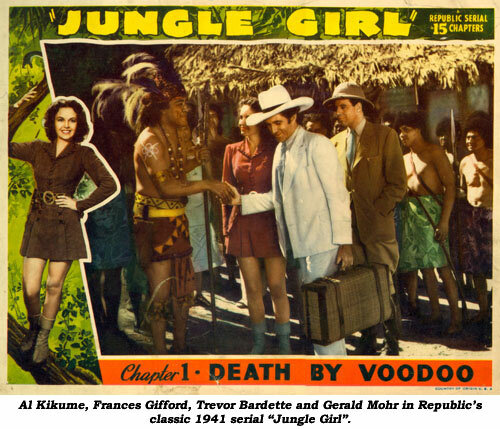 Republic rewarded him later in the year, top casting him as the vicious Slick Latimer in their “Jungle Girl” serial. Following WWII service with the Air Force, radio was Mohr’s real meal ticket throughout the ‘40s and ‘50s. He was the Lone Wolf on Mutual in ‘48 (after starring on screen as Michael Lanyard in three Columbia thrillers in ‘46-‘47). He was the star of “The Adventures of Phillip Marlowe” from ‘48-‘51 on CBS. Mohr was also heard on “Nero Wolfe”, “Burns and Allen”, “Judy Canova”, “Our Miss Brooks”, “The Whistler”, and others, some 500 in all. He was named ‘Best Male Actor on Radio’ by RADIO AND TELEVISION LIFE mag in ‘50. Mohr’s first heavy was as a Nazi saboteur in Roy Rogers’ “King of the Cowboys” (‘43). You may recognize his voice as narrator on some 12 “Lone Ranger” TV episodes circa 1949, and for the opening of U-I’s “Wyoming Mail” (‘50) and Columbia’s “Smoky Canyon” (‘52) and “Montana Territory” (‘52). One of his best roles came next as claimjumper Rod Lacy in Audie Murphy’s “Duel at Silver Creek” (‘52). 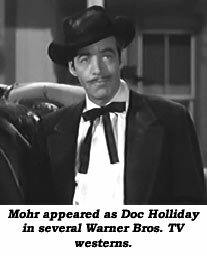 Mohr began working heavily in television in ‘51 and starred as Christopher Storm, the American owner of a hotel in Vienna and a fast man with a gun and dame, in the final revamped incarnation of “Foreign Intrigue” (‘54-‘55). It was then he hooked up with Warner Bros. TV to portray some terrific badmen, charming con men and slick heavies on “Cheyenne”, “Bronco”, “Sugarfoot”, “Maverick” (several episodes as Doc Holliday) “Alaskans” and “Lawman”. Other TV westerns used him also, never as well as WB, but he was seen in heavy roles on “Tombstone Territory”, “Wanted Dead or Alive”, “Texan”, “Rough Riders”, “Bat Masterson”, “Johnny Ringo”, “Tales of Wells Fargo”, “Deputy”, “Overland Trail”, “Outlaws”, “Bonanza”, “Rifleman”, “Iron Horse”, “Stagecoach West” and others. In ‘67 he was the cartoon voice of The Green Lantern on the animated “Superman/Aquaman Hour of Adventure” as well as the voice of Reed Richards, Mr. Fantastic, on the animated “Fantastic Four”. Following an excellent role in Barbara Streisand’s “Funny Girl” (‘68), Mohr was overseas in Stockholm, Sweden, producing and starring in a TV series when he died suddenly of a heart attack at 54 on November 9, 1968. His last role was as a heavy on “Big Valley: Flight from San Miguel”. Mohr was first married to Rita Deneau in ‘39. They had one child but were divorced in ‘57. In ‘58 he married Swedish born Mai Dietrich which endured until his death.